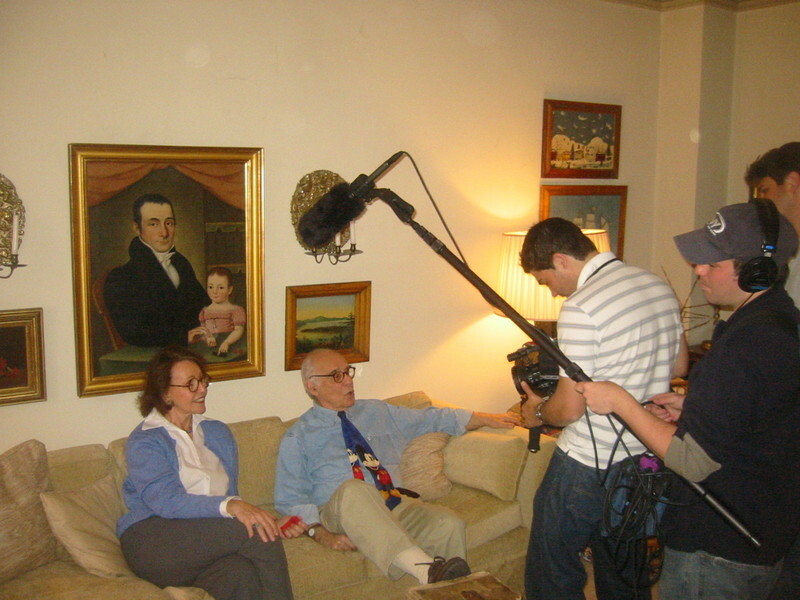 The day started at 11am when the SNY film crew met me at my parents’ place. I’d gotten four hours of sleep. I was shocked when I walked into my old bedroom. The shelves weren’t empty, and the walls weren’t bare; my dad had redecorated with my old baseball stuff that I’d recently put in storage: trophies, posters, and dozens of colorful Topps baseball card boxes. Awesome! The barren room had life once again as a baseball shrine. And, in addition, I’d brought all 30 of my major league team caps and arranged them in one long row (alphabetically, of course) on the counter. I embrace the fact that I’m a dork–but to a certain point. Thus, I made sure to tell the camera that this was my CHILDHOOD bedroom at my PARENTS’ place. I opened the drawers, uncovered the barrels, unzipped the duffel bag, and started showing specific balls to the camera. I showed my batting gloves, lineup cards, baseball cards, caps, and more. Good times. I loved every second of it. For years, my dad and I have had a friendly “who’s more famous” contest. He’s had over 20 books published (including a bestseller called “Children’s Letters to God“) and been on TV and written plays and movies and drawn two syndicated cartoon strips–but I’ve had a pretty good run of my own in the last few years. Well, when SNY said they wanted to interview my parents, I gave my dad heII about riding my coattails and appearing in MY segment. …and they did an outstanding job. When my dad was asked what he thought about my collection, it would’ve been easy for him to poke fun, but instead he talked about how it makes me unique and how my passion is wonderful and that with the current steroid controversy, baseball should embrace a story like this. Meanwhile, my mom was her usual charming self, telling fun stories and even showing a photograph of my first step. 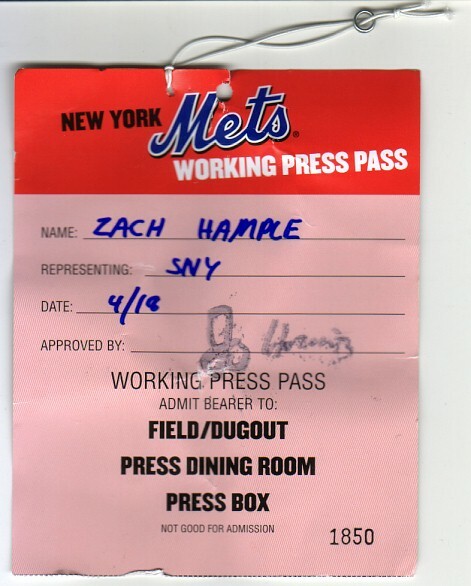 The crew was done at 12:30pm, four hours before we’d meet again at Shea Stadium’s Press Gate. I packed up my 30 caps, straightened the balls, ordered Chinese food (beef w/ broccoli and a baked roast pork bun), and went home for a way-too-brief nap. 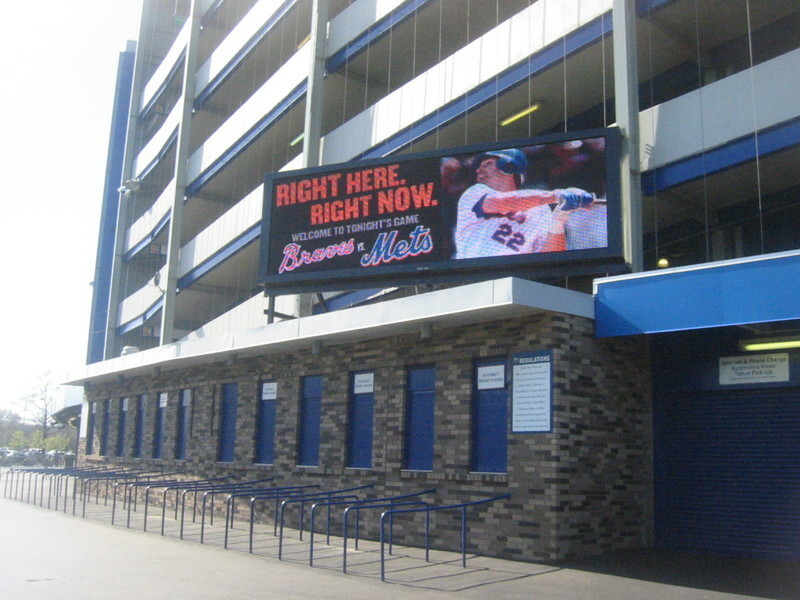 The day before, the scoreboard marquee featured Pedro’s attempt at career win No. 200. But on Tuesday, it wasn’t quite as exciting. I mean, c’mon…Xavier Nady with Jesus Jones lyrics?! I met the SNY guys at the Press Gate. One of them said they had some other business to take care of and told me to wait outside. I ended up waiting for an hour. No joke. And the whole time, fans were streaming past me and heading inside for batting practice. It was painful, but I’ll spare you the details. I really don’t know why I waited so long, but anyway, I finally walked up to the security checkpoint. I signed the waiver and logbook and walked through the hallway and tunnel and out toward the warning track behind home plate. The SNY guy was there. He was surprised to see me and admitted that he’d spaced out. 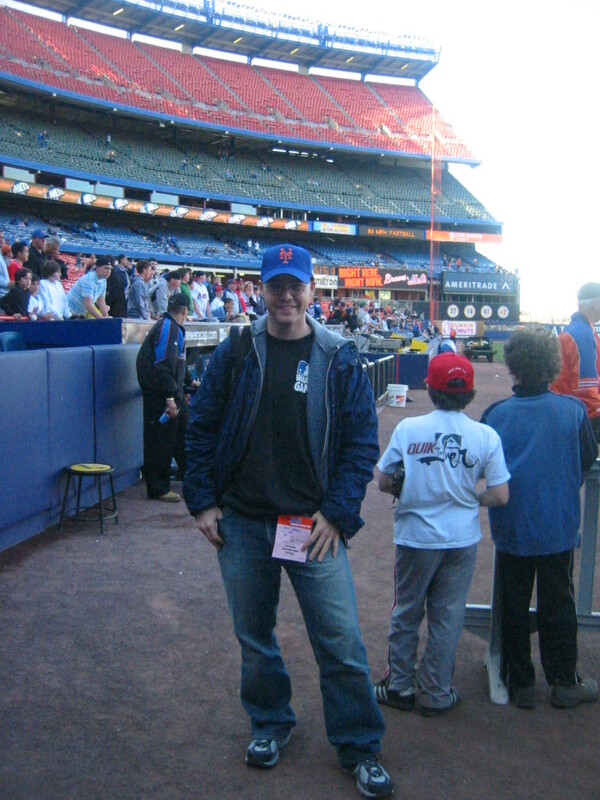 He didn’t need me until close to game time…so I stood helplessly on the warning track as the Mets came off the field and tossed balls right to the spot above the dugout where I would’ve been. I got to wander a bit and take a few pics, but don’t let this smile fool you. I didn’t give a damn about standing on the field. All I wanted was to get up into the seats and try to salvage the day. My god, I had a streak of 429 consecutive games on the line. The last time I’d been to a game and DIDN’T catch at least one ball was September 2, 1993. And now, for no good reason, the streak was in serious jeopardy. Despite Xavier Nady being the best selling point that the Mets could come up with, the stadium was still packed, just like the day before. I went behind 3rd base, hoping for a ball from Chipper Jones or Pete Orr. They were taking fungos. Maybe the batter would hit an extra ball their way? Nope. Nothing. I raced to the left field corner, hoping for a ball from any one of the Braves pitchers who were standing around. Remlinger? Reitsma? Smoltz? Hudson? Nothing. Even Roger McDowell dissed me. I was there too late. No glove trick. No foul balls. It was dead. And I was crapping my pants. I went to the Braves dugout right before the end of BP. I hadn’t gotten anything there the day before, but I NEEDED to make this work. When the last round was done and the players and coaches started picking up the balls, I started shouting at Fredi Gonzalez, the 3rd base coach. He was the only guy that didn’t immediately toss his few balls into the bag. I yelled again. And again. I wasn’t sure if he could hear me. He was 100 feet away, and everyone else was yelling for autographs. People, Chipper is NOT going to sign for you so just shaddap!!! Fredi looked up, but he still dropped his balls in the bag. No wait! Did he hold onto one of them? He started walking toward me, and I kept yelling. He was still 50 feet away and put his hand up as if to say, “Jee-zus, kid, calm down,” but the desperation in my voice must’ve worked because right as he approached, he took a ball out of his glove and tossed it to me. I realized that my 55-game streak of three or more balls per game was in danger, but I didn’t care. 1. Bring a glove and attend batting practice. 2. Sit on the aisle so you can get up and run for balls. 3. Bring rosters of both teams and call the players by their first names. 4. Learn how to ask foreign players for balls in their native languages. 5. Bring a hat of the visiting team. The producer told me to meet the crew in the Loge at the start of the game. That was 20 minutes away, so I grabbed an overpriced/forgettable slice of pepperoni pizza and tried to get another ball. Right field corner? No. Coach Tom Nieto gave it to a little girl. Third base dugout? Got there too late. The concourse behind the plate was packed. (New Shea, where are you?!) First base dugout? Thanks for waving at me, Mr. Delgado, but what I wanted was the ball. I should’ve known he’d hold onto it. He needed it to warm up the infielders, but I was still annoyed. I had five minutes. Was there time for Carvel? Yes? No? Maybe? I decided against it and headed upstairs. I would’ve gotten vanilla in a waffle cone with rainbow sprinkles. Mmm. We completely missed the top of the 1st. While we were getting set up and figuring out the plan, the Braves scored two runs off Victor Zambrano (a.k.a. “Not Kazmir”). Then I started doing my thing, playing righties and lefties differently by running back and forth from runway to runway on opposite sides of home plate–and the entourage followed. It was me, Amanda (who was scared of getting hit by a ball), Amanda’s security guard, two camera men, and a sound guy. Once again, the crew decided to follow me for a mere two innings (which lasted just 20 minutes because EVERYONE, it seemed, was swinging at the first pitch), and during that time, the closest foul ball landed 40 feet to our right. And that was it. 1. I didn’t want to get in trouble. 2. I’ve been there before. 3. I’ll be there again. 4. Security granted me “diplomatic immunity,” and I just wanted to take advantage of it and be left alone. Instead of going to the Braves dugout, I went back to the fancy seats behind the plate to try to get a ball from the home plate umpire as he left the field and walked through the skinny little runway. The fans sitting right above the end of the runway stood up. Were they leaving or getting in position to ask for a ball? “Excuse me,” I said as I entered their row. “Not gonna happen, pal,” snapped the guy closest to me. I found a spot on the edge of the runway, one row in front of him, and when the ump passed through moments later, he tossed up a ball, and I reached out and grabbed it. That ump, I found out later when I looked at the box score, was Marty Foster. You’re referencing Jesus Jones lyrics? Wow. However, that song is heavily used for sports purposes. Yeah, Jesus Jones. 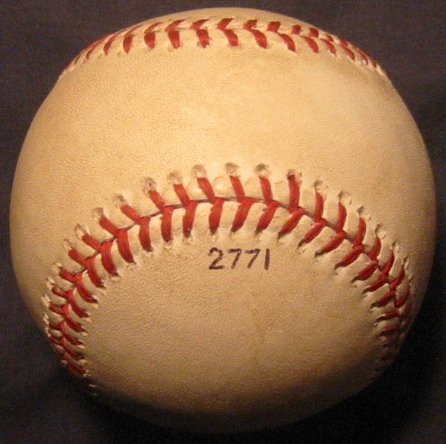 If it’s an other-sport thing, I wouldn’t know, and I can’t remember ever seeing/hearing it used for baseball. Am I a complete freak if I tell you I used to own that CD? No! Not at all! I love that song. Never heard the rest of the album, though. My musical tastes are all over the place. Everything from Britney to Bach. Well, not EVERYthing, but you get the idear. I just got your book yesterday… plus i had your dad’s book all along i didn’t know he wrote it. You guys are lucky to get a book published. How do you do it? You have to come up with an interesting and unique idea, then write the **** thing (or at least a few sample chapters), write a proposal, find an agent, and then hope that the agent can sell it to a publisher. This is not the ONLY way to get published, but it’s a fairly common path. Were you content with your day because of the interviews… TV Cameras… diplomatic immunity… or did only snagging two balls completely ruin it? Choose your destiny. ZH chose his. Gee whiz, Grocery Man, I committed the eternal sin of TYPO as I rushed to write that comment before running off to work. Thank you for pointing it out. Rather than editing it, I will leave it there as proof of my glorious imperfection. lol yeah it’s fine, it’s fun. ‘Twas a fun typo. Between my personal emails, writing for work, writing for me, blogging, and journaling, I probably write about 5,000 to 10,000 words a day. Typos are GONNA happen. The focus has been on that typo for way too long. Really wasn’t meant to be a 6 post after hours topic. Please now, lets carry on folks. Congrats! And by the way, NICE ART on the folks’ wall. What more can you tell us about that painting right over the sofa? Yeah man…what’s up with the Victorian style artwork? Props to “Pop’s” for sporting “Da Mick” tie – I’m a huge fan of Mickey as well. Thanks! All I know about the painting is that the man is a doctor, and he’s taking the little girl’s pulse. You got sharp eyes. That is, indeed, a Mickey Mouse tie.